A thermostatically controlled shower with separate controls for the flow & temperature. Suitable for all types of plumbing installation this shower valve has the added safety benefit of a built in anti scald device should the cold water supply fail. 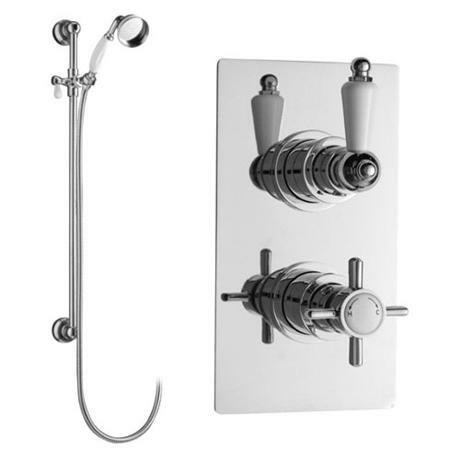 The shower kit comprises a traditional slider rail with a period style hand shower. These shower packs incorporate traditional shower valves with co-ordinating slide rails or fixed head kits. The complete shower package for any period style bathroom. Separate controls for temperature and flow operates on shower accessory. The purchase of the product was so easy; it was the best price around. It arrived in a couple of days with all the necessary instructions for installation.